LANSING — The 2018 election cycle started with a boom for groups that tend to be among the biggest spenders in races for the Michigan Legislature. The main fundraising committees of Senate Republicans, Senate Democrats, House Republicans and House Democrats combined to raise $2.10 million from Jan. 1, 2017, through April 20, 2017, according to disclosures due on Tuesday. That haul, $2.10 million, is the highest total for the first quarter of a non-election year the four committees have reported in a decade. 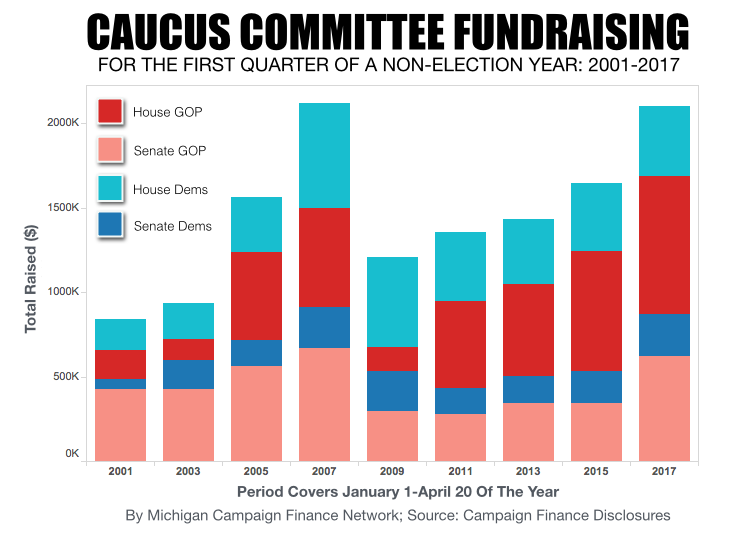 In 2007, the caucus committees combined to raise $2.12 million by April 20, 2007, which remains the record. Since 2007, however, the caucuses’ total for the first quarter of 2017 is more than $400,000 above any combined total over that time period in a non-election year. The numbers point to the expectation that Michigan’s 2018 election will be one of the most expensive in state history. Next year, Michigan voters will choose a new governor, a new attorney general, a new secretary of state and candidates to fill all 148 seats in the Legislature. Plus, there will be a race for the U.S. Senate. Driving up the fundraising totals so far in the 2017-2018 cycle is the fact that the House Republican Campaign Committee alone reported raising $817,422 between Jan. 1, 2017 and April 20, 2017. That’s an average of $52,494 a week over the period. “That amount also puts the caucus far ahead of where it was two years ago,” the press release from the House Republicans said. Two years ago, the 2016 state House races were the most expensive in Michigan history, according to MCFN's tracking. But both the House Democratic Fund and the House Republican Campaign Committee reported raising more between Jan. 1, 2017, and April 20, 2017 than they did between Jan. 1, 2015, and April 20, 2015. 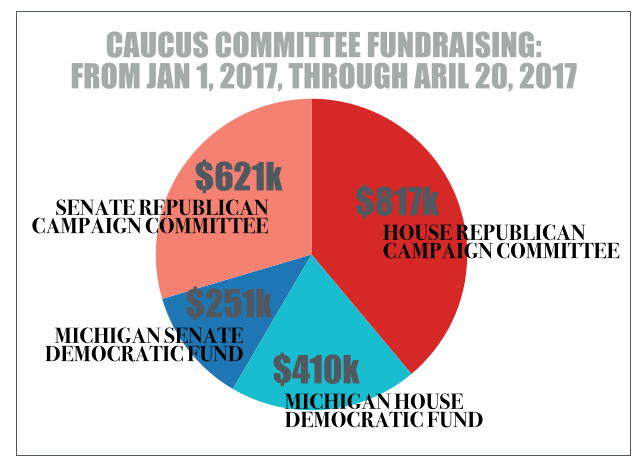 The four caucus committees raised more than any other political committee in Michigan over the first quarter of 2017. A full list of the top 150 political committees in fundraising so far this year can be found by clicking here. The top 150 committees combined to raise $6.8 million from Jan 2, 2017 through April 20, 2017, according to their reports. Below are the four caucuses’ fundraising totals and their top donors for the start of 2017.